By Kazakhstani President Nursultan Nazarbayev. 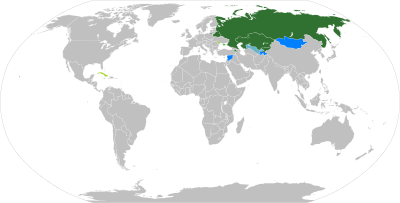 The Eurasian Economic Union (EAEU) [note 1] is an economic union of states located in central and northern Asia and Eastern Europe. The Treaty on the Eurasian Economic Union was signed on 29 May 2014 by the leaders of Belarus, Kazakhstan and Russia, and came into force on 1 January 2015. Treaties aiming for Armenia's and Kyrgyzstan's accession to the Eurasian Economic Union were signed on 9 October and 23 December 2014, respectively. Armenia's accession treaty came into force on 2 January 2015. Kyrgyzstan's accession treaty came into effect on 6 August 2015. It participated in the EAEU from the day of its establishment as an acceding state. In 1994, during a speech at Moscow State University, the first President of Kazakhstan, Nursultan Nazarbayev, suggested the idea of creating a "common defense" space and regional trading bloc in order to connect to and profit from the growing economies of Europe and East Asia. The idea was quickly seen as a way to bolster trade, boost investments in the region, and serve as a counterweight to Western integration unions. To promote further economic integration and more cooperation, in 2000 Belarus, Kazakhstan, Russia, Kyrgyzstan and Tajikistan established the Eurasian Economic Community (EurAsEC) which Uzbekistan joined in 2006. The treaty established a common market for its member states. The Eurasian Economic Community was modelled on the European Economic Community. The two had a comparable population size of 171 million and 169 million, respectively. A session of the Supreme Eurasian Economic Council (composed of the union's heads of state) is held at least once every year. The Customs Union of Belarus, Kazakhstan, and Russia (now the Eurasian Customs Union) came into existence on 1 January 2010. The Customs Union's priorities were the elimination of intra-bloc tariffs, establishing a common external tariff policy and the elimination of non-tariff barriers. It was launched as a first step towards forming a broader single market inspired by the European Union, with the objective of forming an alliance between former Soviet states. The member states planned to continue with economic integration and were set to remove all customs borders between each other after July 2011. In 2011, the then-Prime Minister of Russia, Vladimir Putin, announced his support for Nursultan Nazarbayev's idea for the creation of a Eurasian Economic Union. 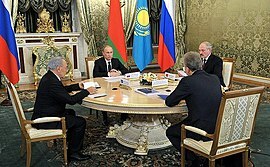 On 18 November 2011, the presidents of Belarus, Kazakhstan, and Russia signed an agreement setting a target of establishing the Eurasian Economic Union by 2015. The member states put together a joint commission on fostering closer economic ties. On 29 May 2014, the presidents of Kazakhstan, Belarus and Russia signed the treaty on the Eurasian Economic Union, which came into effect on 1 January 2015. The presidents of Armenia and Kyrgyzstan were also present at the signing ceremony. Russian president Vladimir Putin stated, "Today we have created a powerful, attractive centre of economic development, a big regional market that unites more than 170 million people"." Kazakh politicians emphasized the Eurasian Economic Union was not intended to be a political bloc, but a purely economic union. Bakytzhan Sagintayev, the first deputy prime minister of Kazakhstan and lead negotiator, said, "We are not creating a political organisation; we are forming a purely economic union." He further stated "it is a pragmatic means to get benefits. We don't meddle into what Russia is doing politically, and they cannot tell us what foreign policy to pursue." By October, the treaty had received parliamentary approval from all three states. On 9 October 2014, a Treaty to enlarge the EEU to Armenia was signed. Kyrgyzstan signed the Treaty on 23 December 2014 and became a member of the Eurasian Union on 6 August 2015. The Eurasian Economic Union is located at the eastern end of Europe, bounded by the Arctic in the north, the Pacific Ocean to the east and East Asia, the Middle East and part of Central Asia to the south. It lies between latitudes 39° and 82°N and longitudes 19°E and 169°W. The union extends across much of northern Eurasia. Its member states cover an area of over 20,000,000 square kilometers, which is approximately 15% of the world's land surface. The Eastern European Plain encompasses Belarus and most of European Russia. The plain is mostly mountain-free and comprises several plateaus. Russia's northernmost regions are tundra. The Russian Tundra is located on the coastline with the Arctic and is known for its total darkness in the winter. Taiga reaches Russia's southern borders in Siberia and accounts for 60% of the country. Towards the Ural Mountains and in northern Kazakhstan, the climate is mostly temperate. Southwestern Russia and Kazakhstan are mostly steppe. The Kazakh steppe covers one-third of Kazakhstan and is the world's largest dry steppe region. Armenia is mostly mountainous and its climate is continental. The landlocked country shares no direct border with other members states. It is located in the southwestern part of Asia, occupying the northeastern part of the Armenian Plateau, and is located between the Caucasus and the Near East. A large amount of lakes and rivers are found in the Eurasian Economic Union. Major lakes include Ladoga and Onega, two of the largest lakes in Europe. The largest and most prominent of the union's bodies of fresh water is Lake Baikal, the world's deepest, purest, oldest and most capacious fresh water lake. The Baikal lake alone contains over one-fifth of the world's fresh surface water. Russia is second only to Brazil in volume of the total renewable water resources. Of the union's numerous rivers, the Volga is the most famous, not only because it is the longest in Europe, but also because of its major role in history. In Siberia the Ob, Yenisey, Lena and Amur are among the longest rivers in the world. The Eurasian Economic Union's highest peak is the Khan Tengri in the Tian Shan mountains, Kazakhstan, 7,010 m above sea level. The lowest point in the Eurasian Economic Union is the Karagiye Depression in Kazakhstan. Kazakhstan's Caspian shore includes some of the lowest elevations on Earth. According to a 2005 estimate by the United Nations, forests cover 40% of Belarus. 11,000 lakes and many water streams are found in the country. Russia is known for its extensive mineral and energy resources, the largest reserves in the world, making it the world's largest producer of oil and natural gas. According to estimates, the Eurasian Economic Union's population of 176 million people is mostly urbanized, with Russia and Belarus having over 70% of their population living in urban areas. In Armenia over 64% of the population lives in urban areas. Kazakhstan's urban population comprises 54% of the country's total population. Russian President Vladimir Putin has stated that his goal was to enlarge the Customs Union to all post-Soviet states, excluding the three Baltic EU member states. According to The Guardian newspaper, Putin's plan is for the Eurasian Union to grow into a "powerful, supra-national union" of sovereign states like the European Union, uniting economies, legal systems, customs services, and military capabilities to form a bridge between Europe and Asia to balance the EU and the U.S.
Ukraine submitted an application to participate in the Eurasian Economic Union as an observer in August 2013. Viktor Yanukovych's decision to abandon an association agreement with the European Union and exclusively pursue integration with the EAEU was a key factor in the Euromaidan protests that ended his term as president of Ukraine and led to the Crimean Crisis. The country's membership in the EAEU was seen by some analysts as the key to the success of the union as Ukraine has the second largest economy of any of the 15 former republics of the Soviet Union. With high tensions between Russia and Ukraine in the wake of the crisis, Ukraine decided to pursue integration with the EU. Turkey was extended an invitation to join the EAEU by Kazakhstan's President Nursultan Nazarbayev on 6 June 2014 but the country prefers to join the EU. Georgia's Prime Minister Bidzina Ivanishvili said in September 2013 he was studying the possibility of acceding to the Union, although he later clarified that Georgia's main strategy was still to integrate into the European Union. Russia's Prime Minister Dmitri Medvedev included Georgia as a prospective member in statements made in August 2013. The council is composed of the Vice Prime Ministers of the member states. 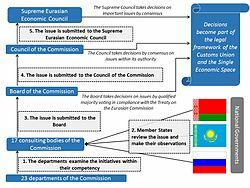 The council of the Commission oversees the integration processes in the Union, and is responsible for the overall management of the Eurasian Commission. It monitors the commission by approving the draft budget of the union, the maximum number of personnel, and the qualification requirements for the commission's employees. The council convenes once every quarter. The Board of the Commission is the executive body of the Commission. It convenes once every week at least, and is responsible for the day-to-day running of the Eurasian Economic Union. It has a wide range of activities, including monitoring the implementation of treaties, submitting annual progress reports and making recommendations. The Board also assists member states in the settlement of disputes, and carries out the draft of the union's budget. Part of its activities include being the intermediary between the departments of the commission and the heads of state of the member states. The approved budget of the Eurasian Economic Union for 2015 exceeds 6.6 billion Russian Rubles. The budget is formed from contributions by the union's member states. In 2015, 6 billion Rubles will be allocated for the activity of the Eurasian Economic Commission, 463 million Rubles will be set aside for financing the operation and further development of the EEU integrated information system designed to promote and inform consumers of the EEU's activities, and over 290 millions Rubles will finance the activities of the Court of the EEU. [note 2] Extra expenses of infrastructure and accommodation of commission workers are financed by Russia. In addition, Russia allocated USD$1 billion to accelerate Kyrgyzstan's entry into the union. Another US$177 million was provided by Kazakhstan. The Moscow International Business Center is a commercial district in Moscow that is currently under construction. The complex includes Europe's tallest towers. Russia has the 12th largest economy in the world by nominal GDP and the 6th largest by purchasing power parity. Since the turn of the century, member states have experienced economic growth with GDP averaging 6% to 8% growth between 2000 and 2007, rising again in 2010 after the Financial crisis of 2007–08. Since the establishment of the Eurasian Customs Union in 2010, trade between member states rose sharply. In 2011 mutual trade was USD 63.1 billion, 33.9% more than in 2010. In 2012, mutual trade was USD 67.9 billion and combined exports reached USD 593.7 billion, while imports were USD 340.9 billion. [journal 2] The first integration stage primarily enhanced trade among member states, bolstered economies and created a legal and institutional foundation for the member states. The second stage includes the free movements of goods, people, services and capital. The Eurasian Economic Union is designed to reach a number of macroeconomic objectives such as reducing commodity prices by reducing the cost of transportation of raw materials, increasing return on new technologies and products due to the increased market volume, and promoting "healthy" competition in the common market. It is also designed to lower food prices, increase employment in industries and increase production capacity. EEU members like Belarus and Kazakhstan (by its Nurly Zhol economic policy) seek to leverage the EEU as a bridge between the European Union and the New Silk Road economic belt. The Eurasian Union is considered as a major player in the world's energy sector, raw materials, arms industry and agricultural production. In 2013 Russia was the 3rd most successful country in the world in attracting capital from abroad. The significant potential for developing infrastructure has led the member states and its partners to create links by constructing roads, railways, electric power grids and fibre-optic cables. The core objective of the Single Economic Space is the development of a single market and achieving the "four freedoms", namely the free movements of goods, capital, services and people within the single market. The four freedoms came into effect on 1 January 2015 (the day the Eurasian Economic Union was officially established). The free movement of people means that citizens can move freely among member states to live, work, study or retire. Citizens of the member states of the union may travel to other member states on an internal passport. Although Russia also admits access to citizens of other CIS states without a passport, it is expected that after 2015 only citizens of the Customs Union will have this privilege. Member states have a common external tariff on all goods entering the market and unified methods of valuing imported goods since the creation of the Eurasian Customs Union on 1 January 2010. Objectives include joint coordination in the area of energy, industry, agriculture and transport. Kazakhstani President Nursultan Nazarbayev had first proposed, in 2009, the creation of a common noncash currency called "yevraz" for the Eurasian Economic Community. It would have reportedly helped insulate the countries from the global economic crisis. In 2012, the idea of the new joint currency found support from Vladimir Putin and Dmitry Medvedev and by 2014 proposals were drafted in Eurasian Commission documents for the establishment of a Eurasian Central Bank and a common currency to be called the altyn which is to be introduced by 2025. When discussing the Eurasian Economic Union, Vladimir Putin said the Eurasian Economic Union would include closer coordination of economic and monetary policy, including the use of a common currency in the future. Although the creation of a monetary union was not envisaged in the Eurasian Economic Union Treaty, Russian Prime Minister Dmitry Medvedev called for the introduction of a common currency for the Eurasian Economic Union. Leonid Slutsky, head of the State Duma's CIS committee, backed Medvedev's proposal to start discussions on the creation of a monetary union. Slutsky said it could be introduced shortly after 2015, when the union's structure becomes clear. Belarusian president, Alexander Lukashenko, circulated the idea of creating a "new euro" for the Eurasian economic bloc. In April 2014, discussions to introduce a single currency resumed. Russia's First Deputy Prime Minister, Igor Shuvalov, stated on 24 July 2014 that the Eurasian Economic Union will have a common currency unit in a span of five to ten years. The Eurasian Economic Union is seen as an energy superpower, producing about 20.7% of the world's natural gas, and 14.6% of the world's oil and gas condensate in 2012, making it the world's top producer in both domains. It also produces 9% of the world's electrical energy and 5.9% of the world's coal, making it the third and fourth producer in the world, respectively. In Kazakhstan, energy is the leading economic sector. The country holds about 4 billion tons of proven recoverable oil reserves and 2,000 cubic kilometers (480 cu mi) of gas. Kazakhstan is the world's 17th largest oil exporter and the world's 23rd largest natural gas exporter. Russia has the world's largest natural gas reserves, the 8th largest oil reserves, and the second largest coal reserves. Russia is also the world's leading natural gas exporter and the second largest natural gas producer, while also the largest oil exporter and the largest oil producer. By 2019, Russia, Kazakhstan, Belarus and Armenia intend to create a common electricity market as well as a single hydrocarbons market by 2025. "With the creation of a single hydrocarbons market, we will have a deeper coordination that will allow us to be more competitive both in terms of pricing and in terms of getting high value added products in this very interesting and important market", stated Eurasian Commissioner Daniyal Akhmetov. The major economic centres are Moscow, Minsk and Astana. The distance between Moscow and Minsk is 717 kilometers, and the distance between Moscow and Astana is 2700 kilometers, making infrastructure a key challenge for the integration of member states. Major infrastructure projects began during the 2000s in order to modernise and connect the regional bloc to other markets, facilitating both integration and trade in the region. In 2007 Moscow announced it will invest 1 trillion USD by 2020 to modernise the country's infrastructure. 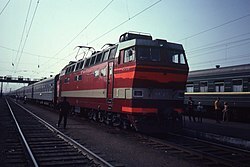 Railways have been the primary way of linking countries in the Eurasian Economic Union since the 19th century. It has always been the main way of transport in the Russian Empire and the Soviet Union up until today. The union ranks 2nd in the world in terms of railway trackage (about 7.8% of the world's share). However it is still looking to improve cross-border trade within the union. The Trans-Asian Railway and the Asian Highway Network are cooperative projects among countries in Asia and Europe which have helped to improve highway and railway systems across the region. Six of the eight major Asian highways go through the Eurasian Economic Union (the AH3, AH4, AH5, AH6, AH7 and the AH8). The highways connect the EEU to many countries including Finland, Turkey, Iran, Pakistan, India, Laos, Thailand, Burma and China. AH6 goes through Russia's Trans-Siberian Highway which is over 11,000 kilometers long. The Trans-Siberian Highway is one of the longest national highways in the world along with the Trans-Canada Highway and Australia's Highway 1. The Single Eurasian Sky programme, administered by the Eurasian Economic Commission, outlines the creation of a single market for air services and a single air traffic zone. The single air traffic zone would make it easier for airlines to draw up new flight paths, thereby increasing the number of flights flying through the region. Eurasian Commissioner, Daniyal Akhmetov, said that it would be created on a step-by-step basis. In June 2014, Belarusian Airline Belavia stated that it was ready to move towards the development of the Single Eurasian Sky. The terms and conditions of operation in the common aviation market have not yet been agreed on. However, the project is likely to be modelled on the European Union's Single European Sky. The project will reportedly help turn the airspace of the Eurasian Union into a popular transit hub between Europe and Southeast Asia. "We should understand that currently, the aviation companies of Kazakhstan and Belarus are not able to compete with Russia's aviation companies. Therefore, the programme will envisage a phasing, creating a competitive environment and so on", Eurasian Commissioner Akhmetov said. Part of the competences of the Eurasian Economic Commission are agriculture subsidies. It is responsible for the coordination of agricultural policy-making between member states and ensuring collective food security. The Eurasian Development Bank finances projects to further integration and develop agriculture. It has disbursed approximately US$470 million for projects between 2008 and 2013. Member states remain optimistic of the union and key partners in the region, namely China, Iran, Turkey remain interested in it. A common belief is that the Eurasian Economic Union has significant potential over the next two decades, with experts predicting a 25 percent growth in the member states' GDP by 2030, which equates to over US$600 billion. The agreement will give member state citizens access to employment and education across the union. It will also entail collaborative policies in many sectors, including agriculture, energy, technology and transportation. These collaborative policies are particularly interesting for countries in Asia seeking access to energy, trade routes in Central Asia and Siberia, and agricultural goods. The European Union and the United States as well as other western countries remain critical of the Eurasian Economic Union, with analysts stating that without modernisation and real economic reforms, the union will have little impact. The popular magazine The Economist stated that the advantages of joining the union remain unclear and further remarked "The agreement was vague, with technical details left unresolved, making it a political show rather than an economic one". Outlets have also stated that without Ukraine, the Eurasian Economic Union has lost a key member state necessary to the success of the union. Bloomberg's business magazine, Businessweek has affirmed that joining Putin's Eurasian Union looks like a bad deal, including for Russia. The union "won't really register on the radar of the global economy," said an analyst at the EU's Institute for Security Studies in Paris. Russia's economic development minister stated that the Turkish economic minister, Nihat Zeybekci, put forward an initiative for closer cooperation with the Eurasian Economic Union, including the formation of a free trade zone between the union and Turkey. In May 2015, the Union gave the initial go-ahead to signing a free trade agreement with Iran. Described as the EAEU's "key partner in the Middle East" by Andrey Slepnev, Minister for trade on the Eurasian Economic Commission board in an expert-level EAEU meeting in Yerevan, Viktor Khristenko furthermore noted that Iran is an important partner for all the EAEU member states. 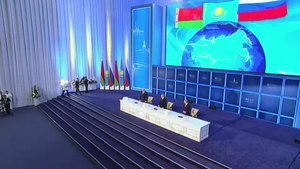 He stated that "Cooperation between the EAEU and Iran is an important area of our work in strengthening the economic stability of the region". In December 2015 a "temporary Agreement" was signed between Iran and the EAEU, which Commissioner Andrey Slepnev characterized as the "first step toward the materialization of free trade between Iran and the Union". One of the key initiatives in the field of free trade and economic cooperation is the proposal on "linking" the Eurasian economic integration and China's strategic "Silk Road Economic Belt" project. The relevant communique was signed by Russia's Vladimir Putin and China's Xi Jinping on 8 March 2015. While the "linking" mostly is understood as support for infrastructure investments, there are ongoing negotiations between the EAEU and China on a "trade and economic agreement" in order to build "an open economic architecture without a political component, oriented on business and reducing barriers". The union is actively seeking to increase trade with East Asia. It commenced talks for official trade cooperation with ASEAN. Officials of both unions discussed opportunities for developing cooperation between them. The South Korean president launched a "Eurasian Initiative", which seeks to connect transportation, electrical, gas and oil links from Western Europe to East Asia. The initiative echoes China's long-standing "New Silk Road" project. The members of the union agreed to step up talks with Vietnam on creating a free trade zone, to strengthen cooperation with China, including in information exchange on goods and services, and to set up expert groups to develop preferential trade regimes with Israel and India. As the trading bloc seeks to profit from the growing economies of East Asia, Russia has made steps to develop its eastern territories, Siberia and the Russian Far East. [journal 5] However, the development of the Russian Far East may face difficulties due to Russia's traditional orientation towards Europe and the region's backward infrastructure and underdeveloped economy. [journal 7] In 2012 Russian President Vladimir Putin called for Russia to "catch the Chinese wind in the sails of the Russian economy". During the same year, a Ministry for the Development of the Russian Far East was established and the country hosted a summit of the Asia-Pacific Economic Cooperation forum (APEC) in its eastern city of Vladivostok. The country also began striking deals and undertook massive efforts to improve infrastructure in its eastern territories. [journal 7] Russia's pivot to Asia included the important task of creating a Eurasian trading bloc. The countries seek to increase their competitiveness by sustaining domestic development and defending their interests in the region. [journal 8] An estimated 76% of Russia's exports depend on resources extracted (or manufactured) in Siberia. 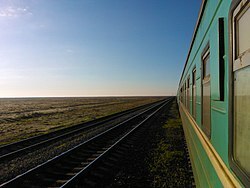 In order to transport goods from East Asia to Europe, they must be transported through Siberia by rail. Hence, the region plays an important role in trade. However, it remains less developed than Russia's western regions and modernisation plans are ongoing. In 2013, Kazakhstan and China signed 22 deals worth $30 billion, including several deals enhancing the countries' cooperation in the oil and gas sector. Some experts also see the union as a way to curtail the loss of Russian influence in Central Asia. [journal 6] Russian politicians have voiced their concerns over Russia's long southern borders and the challenges it may pose. By creating a regional trading bloc to keep its neighbours in Central Asia stable, Russia hopes to find securing its own borders easier. Kazakh President Nursultan Nazarbayev meets Xi Jinping, the Chairman of the People's Republic of China on 6 April 2013. The Eurasian Economic Union has 17 cities with more than 1 million inhabitants, the largest being Moscow. The most densely populated areas are the capital cities of member states and European Russia. Siberia is the region with the least inhabitants. In Russia about 160 different ethnic groups and indigenous peoples live within the country's borders. Kazakhstan and Belarus are home to sizable ethnic Russian minorities. Though the member states of the Eurasian Economic Union's populations are comparatively large, its density is low because of the enormous size of Russia and Kazakhstan. The Eurasian Economic Union's average birth rate in 2010 was roughly 12.5 births per 1000 people, higher than the European Union, which has an average of 9.90 births per 1000 people. According to Article 110 of the Treaty on the Eurasian Economic Union (2014) the Russian language is the working language of the 'Bodies of the Union'. Experts estimate that with the accession of Armenia, the internationally unrecognised Nagorno-Karabakh Republic would not be integrated into the Eurasian Union. Armenia is a permanent political, military and economic ally of Russia, whereas Azerbaijan holds close ties with the west. The Kazakh President Nursultan Nazarbayev expressed concern in 2013 that no reliable customs border between Armenia and Nagorno-Karabakh could be drawn. However, Nazarbayev expressed that he holds all the existing disagreements preventing Armenia's integration into Eurasian Economic Union are surmountable. The Chairman of the Foreign Policy Committee in the Armenian Parliament, Artak Zakarian, announced on 14 May 2014 that Armenia will build no customs border including the region of Nagorno-Karabakh. When Russia's Gazprom bought the gas network of Kyrgyzstan in April 2014 pledging "a stable gas supply", Uzbekistan subsequently cut off its gas exports to Kyrgyzstan's south stating that it had no contracts to sell gas to Gazprom. The cut off happened as Uzbek president, Islam Karimov protested Russia's growing presence in the region. The shut-off left hundreds of thousands in south Kyrgyzstan without gas. The president of Kyrgyzstan has since promised to build a new gas pipeline to the country's south, bypassing Uzbekistan. He also announced the country would pursue integration and continue on its path to join the Eurasian Economic Union. Gazprom later announced it had struck a deal to restore gas supplies to southern Kyrgyzstan. Former European commissioner, José Manuel Barroso stated at the World Economic Forum that the EU supports the regional integration, including the Eurasian Union. He also praised Kazakhstan for joining the bloc. He criticized the post-Soviet space, saying "the integration in the region is not sufficient". However, he warned that the Ukrainian crisis is a major obstacle to good cooperation between the EU and the Eurasian Union. Western analysts generally see the Eurasian Economic Union as a way to reunite many of the former Soviet republics. For example, Washington Post author Abigail Hauslohner wrote the treaty was intended "to further bolster [Russia]'s ties to former Soviet republics." The United States expressed its opposition to the Eurasian Union, claiming it is "an attempt" to re-establish a USSR-type union among the former Soviet republics. In December 2012, former Secretary of State Hillary Clinton claimed "It's not going to be called that [Soviet Union]. It's going to be called customs union, it will be called the Eurasian Union and all of that, but let's make no mistake about it. We know what the goal is and we are trying to figure out effective ways to slow down or prevent it". Kazakhstan's president Nursultan Nazarbayev called it "a hard-won achievement" and "a blessing for our people." Public support in Kazakhstan for the country's accession to the EEU stood at 68% in June 2014, with 5.5% opposed. The Eurasian Customs Union has already brought partial economic integration between the three states, and the Eurasian Economic Union is said to be a continuation of this customs union. However, the impact or legacy of that agreement is unclear – trade between the three states actually fell 13% during the agreement's first year. 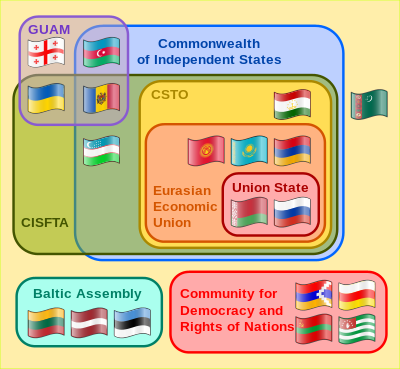 This page is based on the Wikipedia article Eurasian Economic Union; it is used under the Creative Commons Attribution-ShareAlike 3.0 Unported License (CC-BY-SA). You may redistribute it, verbatim or modified, providing that you comply with the terms of the CC-BY-SA.